Slugs are not picky about their diet. They'll eat just about anything they come across as they inch their way across your vegetable garden, flower box and yard. They prefer a few foods over others; when several gather to eat favored vegetation, they can cause rapid destruction. Slugs eat a diverse range of plants, including the leaves of vegetables, flowers and ornamental plants in your yard. They have a preference for young, tender plants and will eat both the stems and leaves, destroying the plant. A large number of slugs can make short work of a newly planted garden. Slugs act as scavengers and eat both dead plants and animals. They help remove dead and decaying leaf debris on the ground, as well as insects, small birds and other animals that they come across. They will also eat fungi, biodegradable trash such as paper, compost and bark. In this capacity, slugs play an important role in the health of their environment. Some kinds of slugs, such as the leopard slug, hunt down and eat other slugs. You can use these cannibals to your advantage to help rid your yard and garden of other types of slugs. Leopard slugs also eat dead plants, debris and decaying matter. 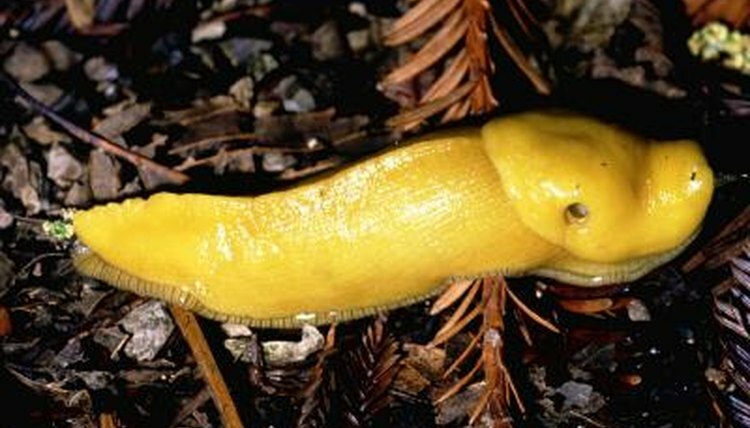 Slugs are drawn to ethylene, which is a chemical released by ripe fruit. This means that just about any type of ripened fruit will attract slugs, such as cherries, raspberries, apples, grapes and strawberries, who will munch on the leaves and the fruit. Beer also releases ethylene, making it a convenient bait for traps that attract slugs searching for food. There are a few plants that slugs do not like. You can place these in your garden instead of attractive plants to help reduce the number of slugs in your yard. These plants include hardy geraniums, fuchsia, nasturtium, houseleeks, purple foxglove, oyster plant, Japanese anemone, figwort and oriental poppies. What Do California Blackworms Eat? What Kind of Food Does a Fungus Gnat Eat? What Are Ladybugs Good for? What Is the Life Span of a Lady Bug?